We turn your wedding dress into a custom Christening or Baptism outfit. Our custom christening gowns are made using as much usable fabric from the wedding dress as possible. A full Christening gown takes quite a bit of fabric so, if you want the entire gown made of only your garment, it needs to be a full length wedding dress. If you don’t mind us augmenting your fabric with some of our own supplies of quality satin, linens and appropriate fabrics and trims, then we can work with shorter dresses and use as much usable fabric from the original dress as possible. If you don’t have any questions, you can access our PDF order form, just . . .
Email: Use the form at the bottom of this page. Our Girl’s Christening Gown uses whatever lace and trim the original wedding dress has to offer. We try to make every dress a work of art. We start with one of three basic styles to choose from, our princess style, our angel style and our Bishop style. Even though we start with a basic style, each gown is customized to take advantage of the materials your wedding dress provides. These photos are examples of what each overall style can look like, to see more examples click on the tab below. 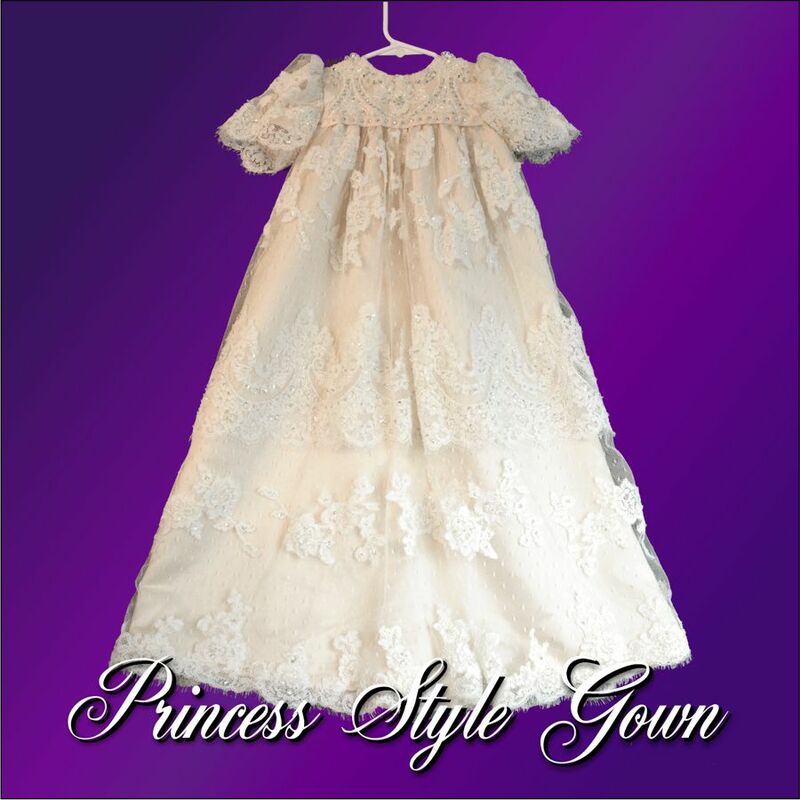 Our Basic Unisex Gown is intended to be a plain christening gown that can be worn by either a boy or a girl. It is available in two styles, Our traditional “Bishop” style that hangs from the shoulder and has a large collar. We can use lace and embellishments on the collar but the skirt is plain. 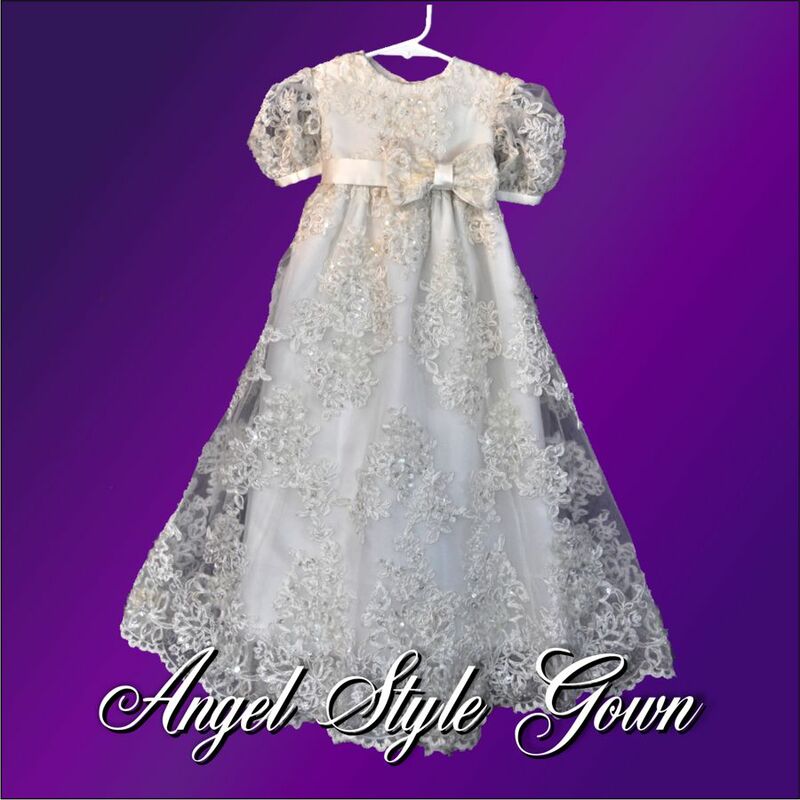 Our “Angel” style has a waist line and usually a pleated bodice and small collar. The skirt is left plain. For an additional fee, we can add an embroidered cross. If you want to us to add further embellishments to either of our unisex styles, then our Ornate Unisex Gown allows us to use ribbon, lace or pleats down the front, buttons, unusual bindings and play with trims on hem lines. These photos are examples of what each overall style can look like to see more examples, click on the button below. If you only want one garment made and want to be able to use it for either a boy or a girl but also want to be able to use the ornamentation from your wedding dress, then a ceremonial robe is the way to go. Our robe is usually lined and has a ribbon tie. It can go over any gown or romper you may already have as well. These photos are examples of what each overall style can look like. A matching bonnet is a traditional accessory to your gown. We can make an ornate, girly bonnet or a unisex bonnet to be used by generations to come. Add a sweet little matching headband. We make them from the materials of your dress for your little princess. We can make a pretty diaper cover to go with the outfit. Our little lined jacket is a way to add some warmth, or just become an addition to an existing heirloom outfit. Some like to get a jacket in addition to a plain unisex gown as a way to dress it up a bit more. We can make a girl’s jacket or boy’s jacket. A pair of custom, matching booties is a must for a complete heirloom outfit. Help protect your heirloom outfit with a matching bib made from your wedding dress fabrics. Most of our gowns are opaque enough not to really need a slip. However, if your dress materials are relatively thin, you might want to consider having a slip made to go with it. Our infant tuxedo jacket is the ultimate formal jacket for your little guy. It can come with or without tails and allows us to take advantage of the different fabrics your dress has to offer. We currently only offer this in infant sizes (3-18 mos). Complete his look with a custom hat. We currently offer two styles, our standard cap and our “fisherman’s” cap. Finish off his little man look with a simple bow tie pin. The pin back slips on under the collar. We can make a cute little vest for boy or girl wear. This is a way to pick up a little of the ornate element from your wedding dress. Do You Need to Get Your Wedding Dress Cleaned Before Sending? If your wedding dress has a lot of dirt and staining–especially along the hem. Then I recommend getting it cleaned before sending it. I do not offer full cleaning services and simply don’t have the facilities to clean a whole dress. If you send the dress without cleaning, I try to work around any stains or heavy dirt but it limits what I can use of the dress materials. If there is a section of a dress that has some staining/discoloration and we want to use that section, I will cut the section I want to use and try hand washing it. Most of the time, I can get age stains, some wine and loose dirt out this way. However, deep stains–like mud/dirt on the hem and train need professional treatment. If my staff and I have to wash sections of a dress, there will be a cleaning fee of $40-$60 depending on how much washing is needed. When your package arrives, I take a quick look at the dress to make sure there isn’t anything that would keep me from getting you what you want. Then, I’ll send you a quick email or phone call to let you know the dress made it safely. Usually, there are several projects being worked on so it can be a week or two before you hear from me again. When I’m ready to start your project, I’ll make an assessment of the materials and will sketch an overall design approach. Using the thumbnail and/or photos of projects that have similar design elements, I’ll contact you with an outline of my plan so that you can give input. From there, we disassemble the original dress, trying to conserve as much of the materials we plan to use as possible. Dis-assembly can take numerous hours–especially if we’re trying to rescue beaded lace without losing too many beads. If you have asked for the left-over materials, we set aside any parts we don’t plan to use. If there are stains we need to avoid, we will also cut around those so that they don’t accidentally get included. Once the available materials are in working condition, we start cutting and sewing until the outfit is done. At that point, we take photos and email them to you along with an e-invoice for any outstanding balance. If you need a larger size, we can do that, just ask about it. What is the best way to pack my wedding dress for shipping? Wedding dresses can be expensive to ship if you have your dress in a preservation box. However, the dress will travel well in the mail if you simply roll it up (like you would a sleeping bag) and put it in the smallest box it will fit in. Don’t worry about crushing it. We know how to get any wrinkles out and it isn’t going to be in the box for very long. If you want to save a bit in shipping expense, cut any netting that may have been used on the under-skirt to give the skirt fullness. That netting is too rough to use on a baby outfit so it is often the part that gets sent back if you ask for the remnants to be returned–why pay to have it shipped in the first place?. You will find UPS or the US Postal Service to have the least expensive shipping options. UPS and USPS each have a regular routine and their drivers know our business and deliver within a specific time frame each day so we know not to run errands at certain times of the day. If you’re shipping using Fedex, please try and send a quick email letting us know. Fedex seems to have only one driver for the entire Dayton area and they don’t come at any set time of the day so, if we happen to have stepped out to run errands when they came by, they won’t leave the package even though we have a secure place for them to do so. It means we will wait another 24 hours for them to try and deliver again or travel out to the airport late in the evening. I would like to get both a girl’s outfit and a boy’s outfit, what are my options? We can make a unisex gown with both a boy bonnet and a girl bonnet. This allows us to use the more feminine elements of the original dress in the girl’s bonnet. If there is enough fabric, we can make both a dress and a romper, however, that takes a full dress and enough opaque fabric. If there isn’t enough fabric for both, we can use some matching fabrics in stock to augment the fabric from the original dress. We try to use the dress fabrics for the primary garments and the secondary fabrics as base slips and accents. This approach may require an additional materials fee. For dresses that have a lot of lace and ornamentation, we can create a unisex gown with a detach-able overlay or a ceremonial robe. This has become a very popular option for people with ornate dresses. Another option is to get a custom christening robe made from your wedding dress instead of a gown or jumper. Ceremonial robes are traditionally more ornate so we can use the embellishments from the original dress and yet it can be used for either a girl or a boy. The robe can go over any standard christening gown or jumper–ask about having a standard jumper or gown made to go with the robe. How do I know what the final outfit will look like? You don’t. You can get an idea of our work from the examples here on this web site. I can assure you that the final outfit will be made with high quality and attention to detail. However, each wedding dress that comes to us is individual. When we sit down to work on your outfit, we will sketch out plans to show you before we actually start cutting anything. We want your input while also taking into context the amount and types of useable materials–along with whether you want a girl’s outfit, a boy’s outfit or both. We use the same overall patterns for every project so you can see some similarities. However, we adapt the patterns to use the materials from the original dress. If there is lace and bead-work, we try to use it in a way that makes sense. If the fabric is heavy, we will use an a-line skirt or the Bishop style, if the fabric is soft enough to hang well, we will use a full, gathered skirt unless you request something different. Every finished outfit is unique and made to be a family heirloom. How much time do you spend on a gown? An average girl’s gown takes about 18-20 hours to make. It isn’t just the actual making of the gown, it is also the task of using materials that have already been formed into a dress to begin with. It can take hours to detach lace, bead work and appliques enough to be able to re-task them. These elements tend to be fragile so we can’t just rip them off, we usually have to detach them one sewn thread at a time. In addition, we’re not working with flat, straight fabric from the bolt. We’re working with fabric that has seams and is usually on angles so it can take hours of pattern manipulation to get large enough areas of fabric without seams or buttons that would show up in the final gown. What do you do with the leftover materials? If there are left-over materials from the original dress, we do not normally keep them. Most of the time, any real usable materials are used up and all that is left is netting or tulle and we simply have no use for it. If you want them, there is a place on the order form to let us know and we will ship them back with the final outfit. There is an extra fee to cover the extra shipping costs and larger box. If you choose not to have them returned, we will toss them because they simply aren’t usable for any other projects that we may work on. If you do choose to have the remnants shipped back, there is a good chance the most of what comes back is the under-skirt netting. Can I donate my remnants for making Angel Gowns? How long are the gowns? We offer three length options: Short (above baby’s feet), Traditional length (usually a couple of inches longer than baby) and Long (34″-36″). The length sometimes varies depending on the amount of usable fabric we can get from the dress. If we’re trying to conserve fabric, the length is the primary place we can do so. Unless someone specifies a length we try to get a longer, modern length (30″-36″) if the fabric is available to do so. Do you make gowns for boys ? We have a couple of options for boys. Instead of a lacy collar, we can use more of a “little man suit”look with an over vest or, the “Bishop” style has a more masculine look to it while still allowing us to add some of the original wedding dress embellishments. We can also make a boy’s romper instead of a gown and we now offer an infant Tuxedo Jacket. How long can I expect to wait before my gown arrives? Most orders normally take about five to six weeks from the day we receive the materials to the day the finished outfit is shipped out. It really depends on what we have going on. If there is a short deadline and you need it in four weeks or less, rush services can be available at an additional charge. If you have a specific date you need the garment by, we will not accept the order unless I believe we can get it to you in time. Send your wedding dress, along with the order form and a $100 deposit. Include any information that you may have been thinking in terms of style and what it is you want. Once I receive the dress, I will contact you to discuss your options. Then I will create a design sketch based on what we’ve discussed and email the sketch to you. Once we’ve established the design (and estimated costs) the cutting and sewing will begin. Feel free to email me in advance to discuss what it is you are wanting. I don’t like to try and design an outfit without the wedding dress materials in hand because I don’t know how the original dress was made or how easy/difficult the materials will be to use until I see them. However, I understand how hard it is to send your wedding dress off to a stranger without knowing something about what it is I’ll be doing with it so I am happy to discuss it over the phone and through email in advance. Do I Need to Get the Wedding Dress Cleaned Before Sending? If your wedding dress has a lot of dirt and staining–especially along the hem, then I recommend getting it cleaned before sending it. I do not offer full cleaning services and simply don’t have the facilities to clean a whole dress. If you send the dress without cleaning, I try to work around any stains or heavy dirt but it limits what I can use of the dress materials. If there is a section of a dress that has some staining/discoloration and we want to use that section, I will cut the section I want to use and try hand washing it. Most of the time, I can get age stains, some wine and loose dirt out this way. However, deep stains–like mud/dirt on the hem and train need professional treatment. If my staff and I have to wash sections of a dress, there will be a cleaning fee of $40-$60 depending on how much washing is needed. At the design stage, I’ll let you know if washing is going to be needed to get you what you want. How do I ensure the dress will fit properly? The easiest way is to make sure you get accurate measurements for us to work with. There is space on the order form for specific measurements. We will be using those measurements to set up our dress forms. As long as we have accurate measurements to begin with, we should be pretty close. There is a fitting stage worked into our process as well. Once the basic construction of the gown is done, I will send the gown along with instructions and some tools for letting me know where there may need to be adjustments. How much is shipping going to cost from beginning to end?